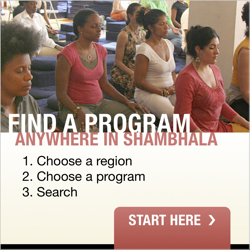 Prerequisites: The Program is limited to tantrikas and sadhakas. Pricing and generosity: We are unable to offer our usual Generosity Policy for this program. If the “program price” is an obstacle for you, please consider paying the “reduced price”. If you are unable to afford the reduced price, please contact us at [email protected] as soon as possible. For those who can offer more than the program price, we have a “patron price”. Your generosity in offering the patron price helps cover the costs for others who are not able to pay the full program price. Heart gift: In addition, we will provide an opportunity to express appreciation for Acharya Chapman's teaching by collecting a monetary gift for her. About Acharya Chapman: Acharya Chapman has been a student of Trungpa Rinpoche's since 1974. After his parinirvana, she spent twenty years studying Mahamudra with Thrangu Rinpoche. She completed the three-year retreat at Gampo Abbey, and led two subsequent retreats, including 9 months of intensive Mahamudra practice. She has been authorized by Thrangu Rinpoche to teach the traditional Kagyu Mahamudra as well as having received his blessing to teach Trungpa Rinpoche's approach to Mahamudra. Additionally, she is a lead teacher for the Ashe Mahamudra practice, which is based upon the terma teachings of the Vidyadhara.